The H-1B visa is a work visa authorized under the Immigration and Nationality Act, section 101(a)(15)(H). It is a temporary issued for the specific purpose of allowing United States employers to employ foreign workers in “specialty occupations” for a set period of time. “Specialty occupation” is defined as a position that requires theoretical and practical application of a body of highly specialized knowledge (such as biotechnology, chemistry, architecture, engineering, mathematics, physical sciences, social sciences, medicine and health, education, law, accounting, business specialties, theology, and the arts), and the position requires a bachelor’s degree or its equivalent as a minimum (with the exception of fashion models, who must be “of distinguished merit and ability”). To be H-1B visa eligible, the foreign worker must possess at least a bachelor’s degree or its equivalent and state licensure, if a state license is required to practice in the occupation. An H-1B visa authorization is strictly limited to employment by the sponsoring employer. Once that employment terminates, the visa expires. A significant benefit of the H-1B visa is that visa holders can bring their immediate family members (spouse and children under 21) to the United States as dependents under the H-4 visa category. 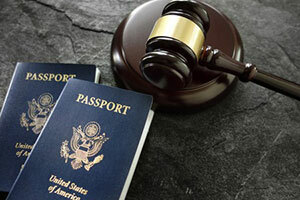 The law imposes a limit on an H-1B visa holder’s maximum length of stay. Note however that the foreign worker has no obligation to remain on the job for any minimum length of time. has a pending I-140 immigrant petition or a labor certification. has an approved I-140 immigrant petition, but is unable to initiate the final step of the green card process. is doing certain United States Department of Defense work. is a citizen of a country that has been designated as a country that has different terms of duration under applicable law or policy. An H-1B visa is not the only work visa available to foreign workers and their United States employers. You should work with an experienced immigration attorney to help you determine which type of visa is best suited for your needs. Here is a quick comparison guide showing how an H-1B visa compares to other types of work visas. Both H-1B and L-1 visas are temporary. Both visa processes allow the foreign worker to be in the United States with the intention of immigrating to the United States (called “dual intent”) and both allow premium processing, meaning that the application will be acted on quickly if the premium processing fee is paid. Recently, the premium processing was suspended, though your immigration attorney can advise you on the current status of premium processing. Another option for foreign workers is the E-2 visa. Authorizations under the E-2 visa differ from H1-B in important respects. With an E-2 visa, the foreign worker will not be allowed to remain in the United States under dual intent. If the foreign worker changes employers while in the United States, the process for transferring the visa authorization to a new employer can be complicated. However, under the E-2 visa, the foreign worker’s spouse may work, and the visa is easier to renew than other work visas. 20,000 additional H-1Bs are available to foreign nationals holding a master’s degree or higher degree from a U.S. university. All non-immigrant foreign national workers and contractors who work on projects for universities, non-profit research facilities associated with universities, and government research facilities. Universities can employ an unlimited number of foreign workers otherwise qualifying for the H-1B as cap-exempt. Their contract employers must show 1) the majority of the worker’s duties will be performed at the qualifying institution, organization or entity and 2) the job duties directly and predominantly further the essential purpose, mission objectives or functions of the qualifying institution, organization or entity. Free Trade Agreements carve out from the above quota caps 1,400 H-1B1 visas for Chilean nationals and 5,400 H-1B1 visas for Singapore nationals. Due to these exemptions and roll-overs, the number of H-1B visas issued each year is significantly more than the 65,000 cap. The cap is reached almost immediately after the petition period opens. For example, the United States Customs and Immigration Service (USCIS) accepted H-1B Petitions for Fiscal Year 2018 starting from April 3rd, 2017 until April 7th. The H-1B cap was reached on April 7th, 2017. For Fiscal Year 2019, USCIS will start accepting applications on April 2, 2018, for visas that count against fiscal year 2019 starting in October. The earliest work start date will be October 1, 2018. USCIS accepts H-1B visa applications no more than 6 months in advance of the requested start date. If you are a foreign worker who is planning to apply for an H-1B visa or any other kind of visa, now is the time to consult with an experienced immigration attorney. The attorney will help you select the visa program that best meets your specific needs and improve your chances of success without unnecessary cost and delays. Employers seeking to bring foreign workers to the United States should get legal assistance as well. Employers need to make sure they understand their rights and obligations in connection with their foreign workers. Doing it right at the outset with the assistance of a reputable immigration attorney will save you time and money in the long run.